Leading Manufacturer of fx series rotary unions from Navi Mumbai. These compact and versatile Rotary Unions can be used for water intermittent steam or hot oil. 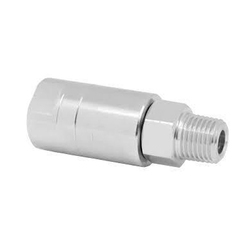 the stainless steel housing consists of a mechanical seal having face combination of Tungston Carbide v/s Carbon Graphite and rotator shaft guided by two precision ball bearing that keeps the seal faces in perfect alignment. The seal faces are micro-lapped to an optical flatness of less than 2 light bands to ensure leak proof operation. Looking for Rotary Unions ?